We salute Chairman Omali Yeshitela for ripping down anti-African mural from St. Petersburg City Hall 50 years ago! ST. PETERSBURG, FL––Chairman Omali Yeshitela of the African People’s Socialist Party (APSP) will be honored in an evening reception where he will tell the story of the 1966 protest that culminated in his tearing down of the anti-African mural which had hung in St. Petersburg’s City Hall since the 1940s. The event will take place at Akwaaba Hall at the Uhuru House, 1245 18th Ave. South, St. Petersburg on Tuesday, Sept. 13th at 6 p.m. and is sponsored by the Uhuru Solidarity Movement (USM). 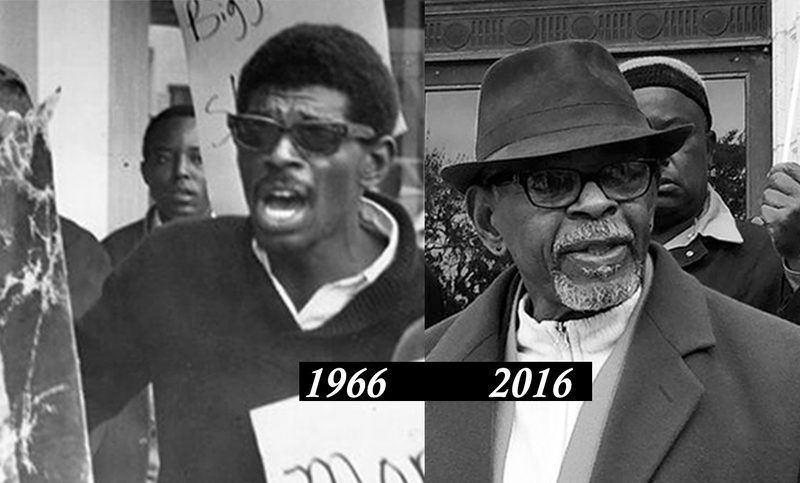 Fifty years ago, on December 29, 1966, the Chairman was a local leader of the Student Nonviolent Coordinating Committee (SNCC). It was a time when the African community all over the U.S. and around the world was rising up in a revolutionary movement; when anti-colonial struggles were the main trend in the world and the cry for “Black Power,” resonated across the planet. The mural bitterly represented the place that colonized black people were relegated to in this city, where African people were forced to function as oppressed servants to the white tourist industry and elderly white retirees. The offensive mural represented a city where African people for decades were confined to housing in a small, two-mile square area of south St. Petersburg that was subjected to a curfew after 9 p.m. every night. Chairman Omali and the local SNCC branch had repeatedly petitioned the city in writing to remove the mural that had been displayed on the stairwell of City Hall since the early 1940s. The mural depicted hideous caricatures of African people playing music on the beach for white revelers, “in the most despicable, derogatory manner,” stated the Chairman. For that bold act in defense of African dignity, the Chairman was sentenced to five years on multiple felony charges and served two and a half years in prison. The space on the wall has remained empty since the mural was torn down. While an article in the Tampa Bay Times in June reported that the city’s public arts committee tasked with replacing the mural was going to “extend a personal invitation to the man who removed it,” Chairman Omali confirms that he was never contacted by the committee or the city to participate in the process of replacing the mural. The same neocolonial and ruling class forces that Chairman Omali Yeshitela and the Student Nonviolent Coordinating Committee were fighting 50 years ago are coming out now to try to continue the cover up. Advances in civil rights and inclusivity? This is the city where three African teen-aged girls were murdered by drowning by sheriff’s deputies earlier this year; where 48 percent of the African population lives at or below the poverty line; where the city spends 72 times more on policing African neighborhoods than supporting neighborhood and business associations; and where since the year 2000 African men account for 100 percent of the increase in poverty in the prime career-building ages between 18 and 44. In 2001 a Concerned Citizens Committee petitioned and won the St. Petersburg City Council to put up a plaque in the spot where the mural once hung—the only viable response to the mural. The plan was scrapped when the council could not agree to use the Chairman’s legal name, Omali Yeshitela, only attributing the action to Joseph Waller as the Chairman was known in the 1960s. This was a refusal to recognize who the Chairman is today: the worldwide leader of the African Revolution who developed the theory of African Internationalism, built revolutionary organization all over the planet and whose analysis and summations have influenced a whole new generation of African resistance today. Put a new one up and we’ll tear it down again! The International People’s Democratic Uhuru Movement (InPDUM) is demanding “black community control of the mural.” What happens to the spot on the wall where the mural once hung will be determined by the African working class! The local branch of InPDUM, led by Gazi Kodzo locally protested the lying, white nationalist city arts committee in July following a protest disrupting a city council meeting last February. The reception is open to the public and is an opportunity for all those who support Chairman Omali for his bold action and his continued life-long work for justice and liberation to meet and talk with him. To RSVP or for more information call 727-888-3739 or email [email protected] Refreshments will be served. You may also sign up to our event on Facebook.